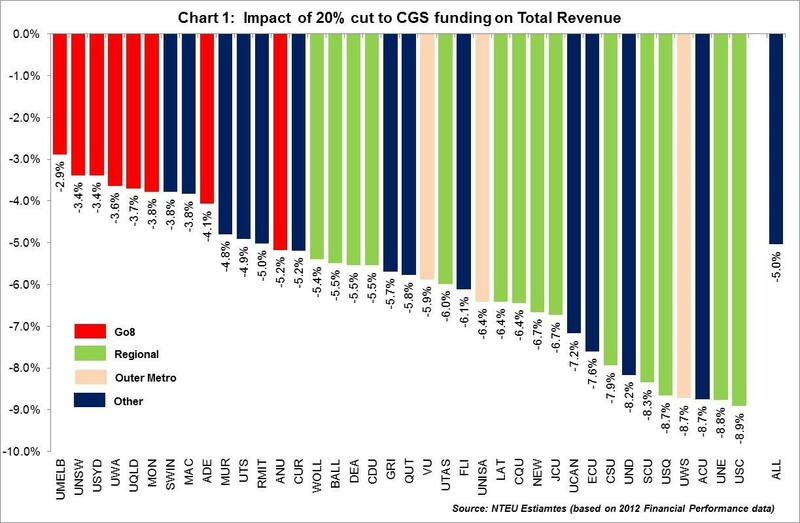 The impact of the Federal Budget’s 20% per student funding cut leaves universities with a massive funding black hole amounting to more than $1.5 billion a year from 2019 onwards, argues the National Tertiary Education Union (NTEU) in its latest budget analysis briefing paper. The impact is heavier upon regional and outer metropolitan universities that are traditionally more reliant on Commonwealth Grant Scheme funding as a source of income. With half of university teaching already being delivered casual staff with little to no job security and retiring academics being replaced by casuals, the situation has become unsustainable and the quality of university education is in jeopardy. NTEU estimates of the impact of the cuts to individual universities in 2019 show that the full impact of the cuts, all other things being equal, will vary from about $14m at the University of Notre Dame in 2018 to about $75m at Monash. These severe cuts to public funding mean that each university will face either significantly increasing student fees and debts, or compromising the scope, nature and ultimately the quality of the teaching, research and community service they deliver to their students. This budget leaves universities with no reasonable choices. The NTEU also expresses concern the public university system will be further undermined by the transfer of public funding to enable direct competition from private non-university providers, including for-profit providers. We are concerned that the viability of some public universities will be undermined by an open market policy framework as was seen in Victorian vocational education and training, which resulted in job losses, course and campus closures and loss of community and student services in TAFE institutes, especially in regional areas.